A recurring theme here at the A.V. Club Taste Test laboratories seems to be "Things that are good on their own are rendered suspect once combined and/or bottled." See: Jones' ham soda, A&W; and Sunkist Floats, and bacon combined with pretty much anything. 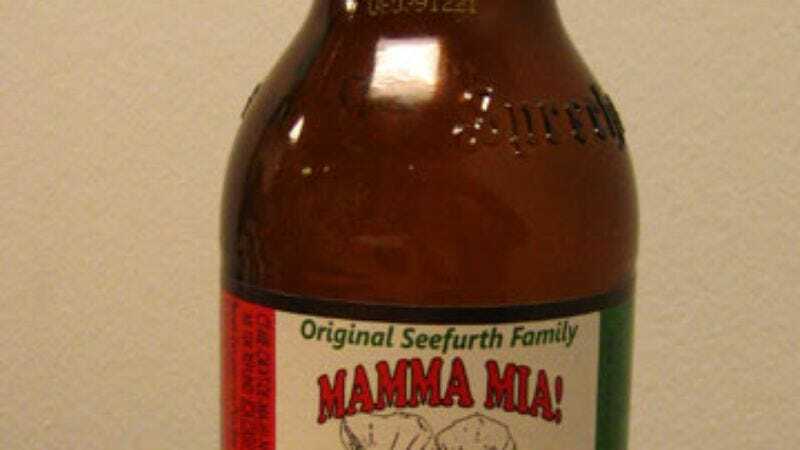 So it's understandable that we regarded Mamma Mia Pizza Beer with a bit of apprehension. In spite of the label's assertion that it's "So good it deserves a wine glass," prior experience has shown us that two rights often make a wrong when it comes to novelty food and drink. Conceived by a family of homebrewers and bottled and distributed by Milwaukee's Sprecher Brewing Co., Pizza Beer claims to be the world's first culinary beer, ideal for meal pairings. While its flavors (oregano, basil, tomato, and garlic) are all heavy hitters in the kitchen, they aren't normally associated with beer, which tends to favor fruit or other sweet additives, like honey or chocolate. The thing is, in order to properly discern those flavors on the first sip, it takes a fairly well-trained tongue, something none of us tasters really have. (Ours have been blunted by years of cheap beer or flat-out beer avoidance.) Yet we managed to overlook our dubious credentials and take on the arduous task of drinking alcohol in the afternoon at work. Taste: In spite of showy displays of sniffing and swirling, the overwhelming first reaction was along the lines of, "Huh, tastes like beer." Further sipping and swishing gradually revealed subtle undertones that can only be described as "vaguely Italian-y," and subsequent burps affirmed that there was, indeed, pizza in this beer. It's a brown ale, which means it's fairly mild-tasting, while not particularly crisp—this is a beer demanding checkered tablecloths and candles stuck in Chianti bottles, not summertime patio sipping. Most tasters agreed that, while they would probably not seek out Pizza Beer as a pizza substitute, they could see drinking it with a meal. — "It's like a pizza roll at the start, then it turns into beer." — "I got the exact opposite, beer first, then pizza." — "When you tilt it toward your face, you can smell tomatoes, and it kinda makes you gag." — "It's like drinking really watery pasta sauce." — "No, it tastes more like beer." — "I think you should note that no one is reflexively gagging yet. Or spitting." — "It's like drinking beer at a pizza place." — "If I were drinking this with a pizza, I probably wouldn't even notice the pizza taste in the beer." — "I love all these ingredients, but not as beer." — "It's not nearly as bad as it sounds." — "I think it would be easier to drink it with pizza or a vaguely Italian-ish meal." — "It does taste a little like fermented pizza." — "It's not very crisp or strong. It doesn't have the sharpness of really cheap beer." — "Ugh, I don't like the smell." — "The pizza flavor doesn't really hit you until after—it's more just a beer-y taste." — "I'd rather just have a beer-flavored beer." — "It really does taste like pizza in the way pizza-flavored Combos taste like pizza… that artificial, everything-is-blended way. I was expecting it to taste too much like oregano or garlic or something, but it mostly just tastes like generic pizza flavor. Not great, but not bad." Where to get it: So far, it looks like Pizza Beer is only carried by a few specialty restaurants and larger beer/wine vendors in the northern Illinois area. (We got ours at Binny's Beverage Depot in Chicago.) Information about distribution can be found at mammamiapizzabeer.com.